I have to be honest. Chicken breasts are not my favorite cut of meat. They are incredibly lean, with little fat and lots of protein. This makes them very healthy, but challenging to keep moist and tender if you do not have the right techniques. This recipe will give you a great foundation for cooking perfect pan seared chicken breasts. Today, we are seasoning the chicken breasts with a bold cajun rub, sautéing them in olive oil & butter, and then finishing them off with a creamy white wine sauce. 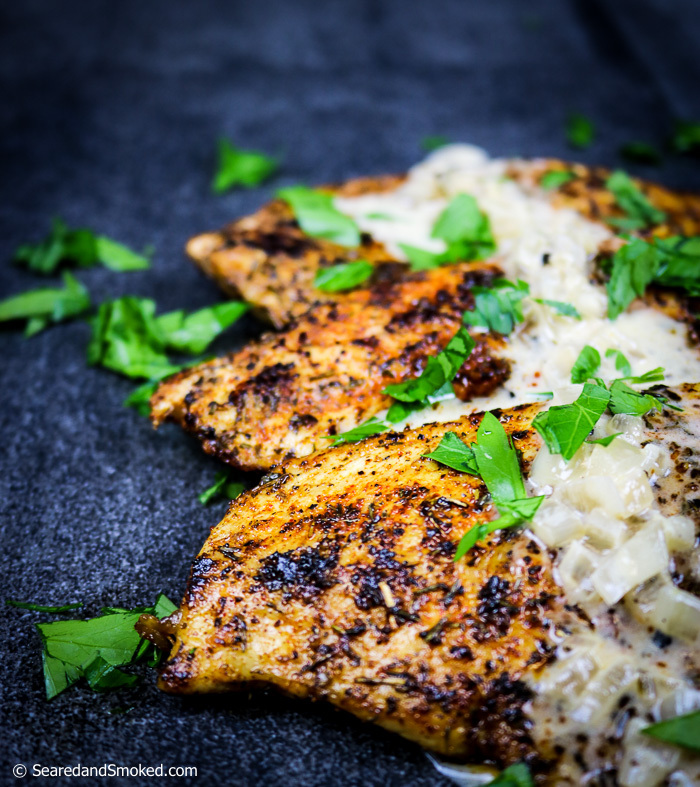 You will love this….changing your idea of what chicken breasts can be. Do you know me? If you do, you know I love potatoes. I count them as vegetables. I mean, they grow in soil. That counts for me. 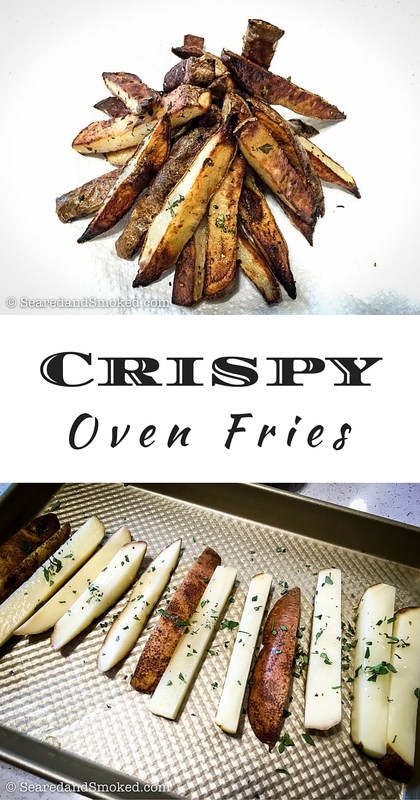 If you are looking for a good recipe for crispy oven fries, give this a shot. I love them as a side for a juicy steak or a tender rack of ribs or a classic burger. If you have a couple of good non-stick pans, they are pretty easy to execute and quite delicious. Nice crispy brown edges and tender on the inside. We are going to cook these fries at 450 F. When ever I cook at temperatures over 425 F, I like to use peanut oil. You will find less smoke coming off the oven and your food will brown, instead of burn. You can also use safflower or sunflower seed oil. Cut 4 large russet potatoes into 1/2 inch x 1/2 inch x potato length pieces. Fill a large pot of water with 8 quarts of water. Add 1 cup of Salt. 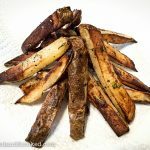 Soak fries in the brine for 30-60 minutes. This is going to draw out some starch and moisture from the potatoes, helping out our cooking process, making them crispy. 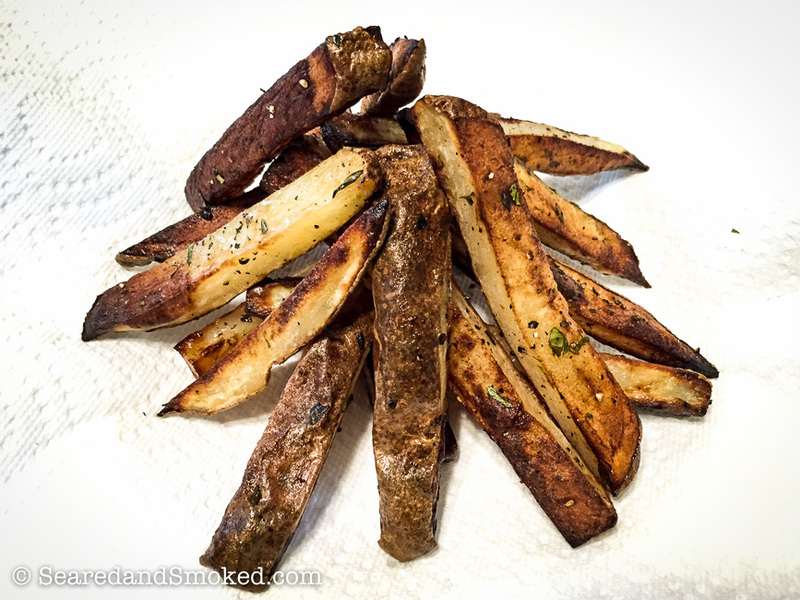 Remove fries from brine and dry on paper towels. Pat dry if needed. Coat non-stick pans with peanut oil. Add fries to pans, evenly spread out. Drizzle with peanut oil. Season with a light dusting of seasoned salt. Grind fresh pepper over the fries. Sprinkle with parsley and thyme. Flip fries and repeat. Cook at 450 for 15 minutes. Flip and cook for 10 minutes. Flip and cook for 10 minutes. (Some ovens cook faster than others, decrease or increase time if needed). 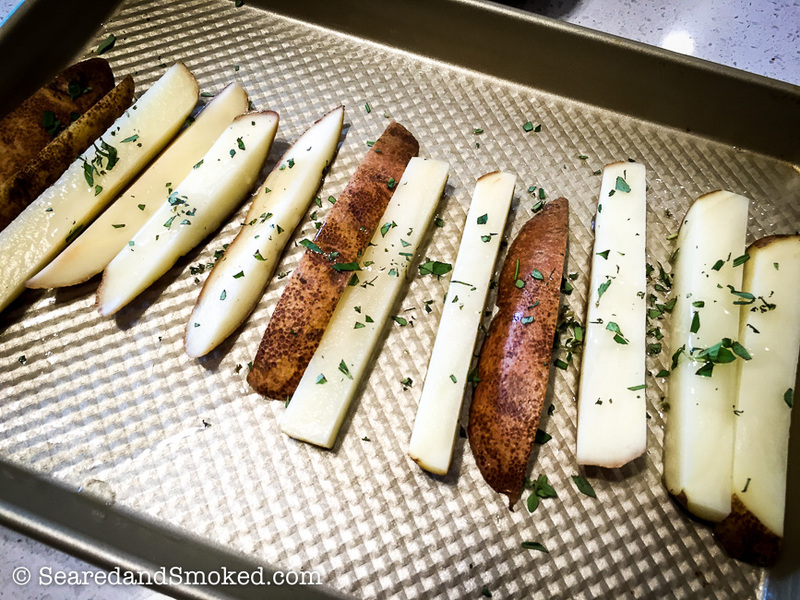 Pull from oven when most sides of the fries are golden brown. 4 Large Russet Potatoes Try to pick out nice uniform oval potatoes. Fill a large pot of water with 8 quarts of cold water. Add 1 cup of Salt. Coat 2 full sized non-stick pans with peanut oil. Add fries to pans, evenly spread out. Drizzle with peanut oil. Season with a light dusting of seasoned salt. Grind fresh pepper over the fries. Sprinkle with parsley and thyme. Flip fries and repeat. Flip and cook for 10 minutes. (Some ovens cook faster than others, decrease or increase time if needed). When the fries are golden brown and crispy to the touch, they are done. 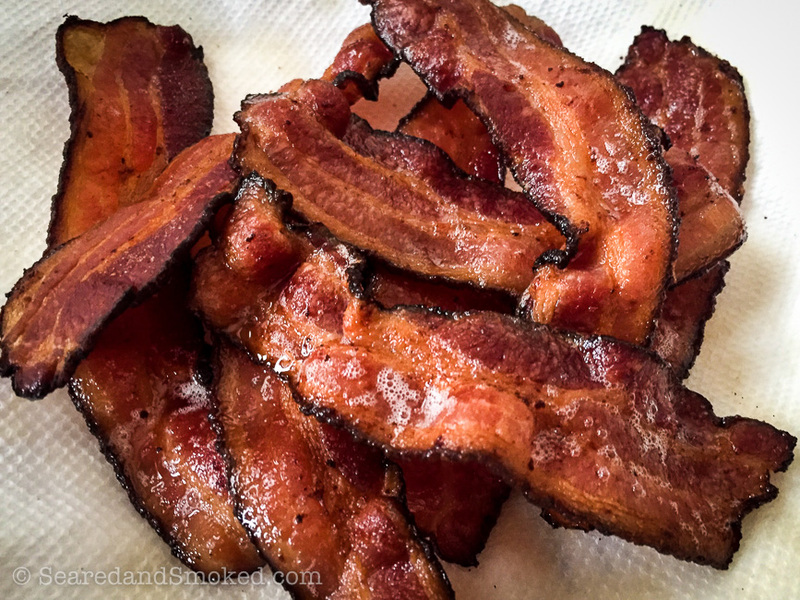 Who does not love pan fried bacon? Nobody. But that does not mean people know how to cook it properly. I have experienced some of the worst bacon at Breakfast Restaurants. So often that I rarely order bacon when I am out for breakfast. They either serve it floppy and fatty, or burnt crisp. There is a sweet middle ground that is easily mastered. 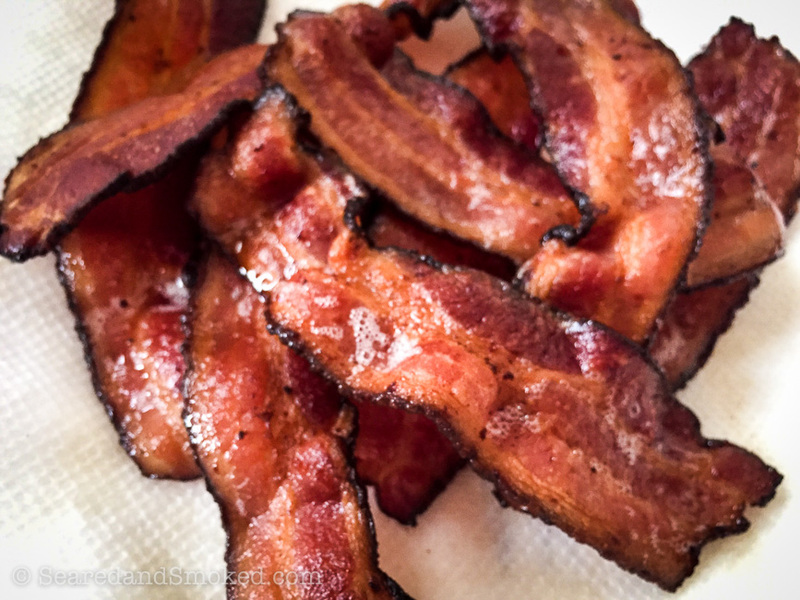 Below is your personal guide to perfect pan fried bacon. A ritual I enjoy every weekend. Pick out Quality Bacon – this is the easiest step to better bacon. Most commercially produced bacon says it is smoked. Yeah, maybe for 5 minutes. Most of it is cured in a salty cocktail solution. Pick out a quality package of bacon. Read the package for ingredients to compare and look for the pretty bacon. You will know when you see it. Take a look at this stuff below I found in Vermont when I was on vacation. 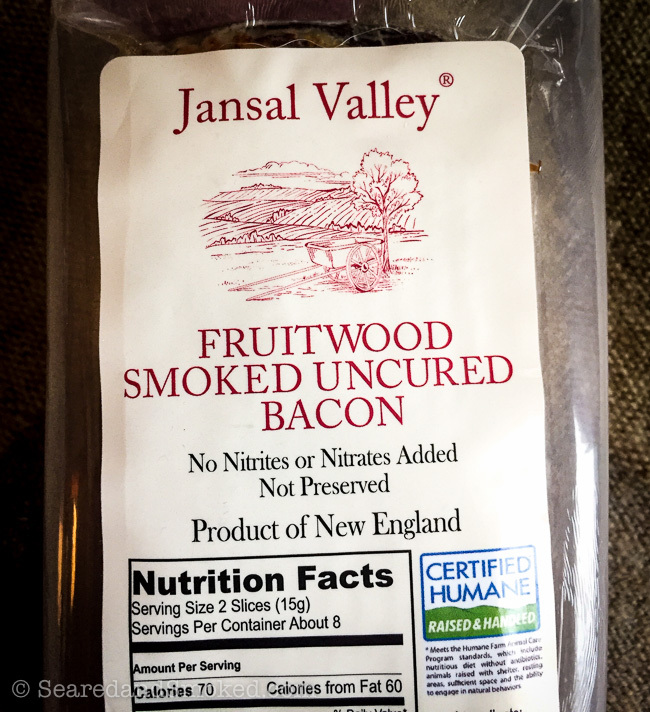 I do not know where Jansal Valley is, but I want to go there after trying this bacon. It has a great natural saltiness and sweetness in the background. You can order their awesome bacon online, delivered to your door. 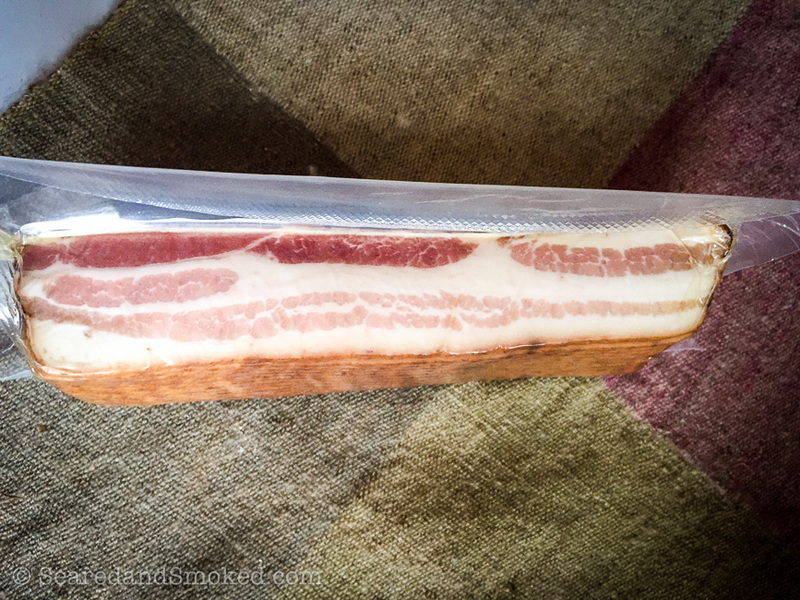 If you want to try another awesome bacon, check out Nuenske’s Bacon. My favorite is the thin sliced apple wood smoked bacon. Same great flavor as the thick cut, but you can have a few more pieces with each breakfast. You will find quality bacon is easier to cook and the rendered fat does not burn easily, staying nice and clear. Store the rendered fat in a mason jar when cleaning up. You can use it to start frying bacon that has less fat or frying eggs, etc. Use a Heavy Pan – Use a pan that will create a buffer between the stovetop and the bacon. Using a heavy pan will give you a more constant heat source, ensuring your bacon does not burn. When you go shopping, compare the weight of the pan. You might pay up a little, but its worth it. I just purchased at a nice Cuisinart 12″ Fry Pan, and it does the job nicely. 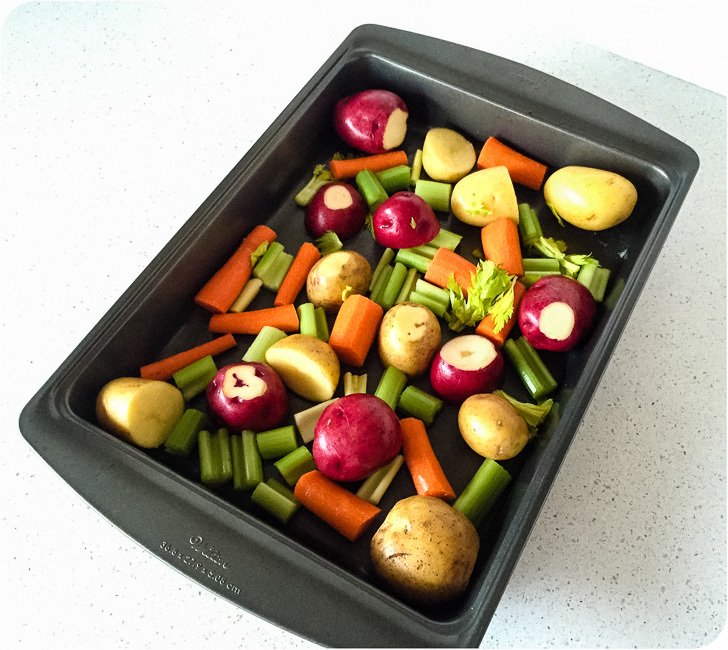 Preheat your pan over Low-Medium Heat – Preheat your pan for about 5 minutes. 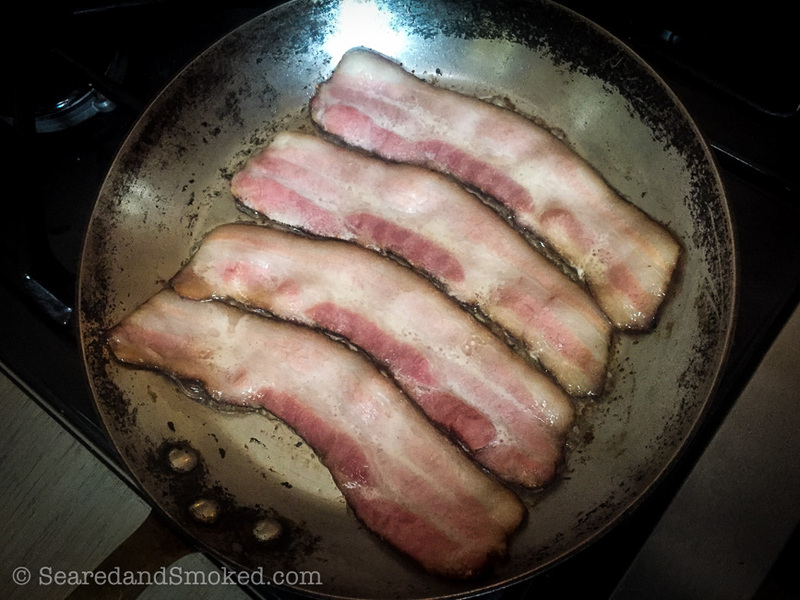 When I lay the bacon in the pan I light to hear a quiet sizzle. Not a big hissing tantrum. By preheating a little, we can develop a nice layer of bacon fat in the bottom of the pan more quickly. Frying fat in rendered fat is pure magic. Fill the entire bottom of the pan with bacon – Never put just 2 slices of bacon in a pan and expect great results. You want the bacon to fry in its own fat. With out a full pan of bacon, this does not happen and you will find your bacon cooks unevenly. Often with spots that become burnt. Flip Often – I think this is where most people go wrong. You cannot throw bacon in a pan and walk away for several minutes or ignore them as you make the perfect omelette. When they hit the pan, flip every minute. As you get closer to being done, flip every 30 seconds. An extra minute can ruin the perfection we are shooting for. Baste the Bacon in its own Fat – Often you will find that the liquid fat might run to one side of the pan or perhaps toward the outside of the pan. In order to have awesome results, you want to make sure all the bacon gets some of that love’n. The best way to do this is to gently swirl the pan around and tilt it back and forth periodically while frying. This speeds up the cooking process and ensures consistent results. 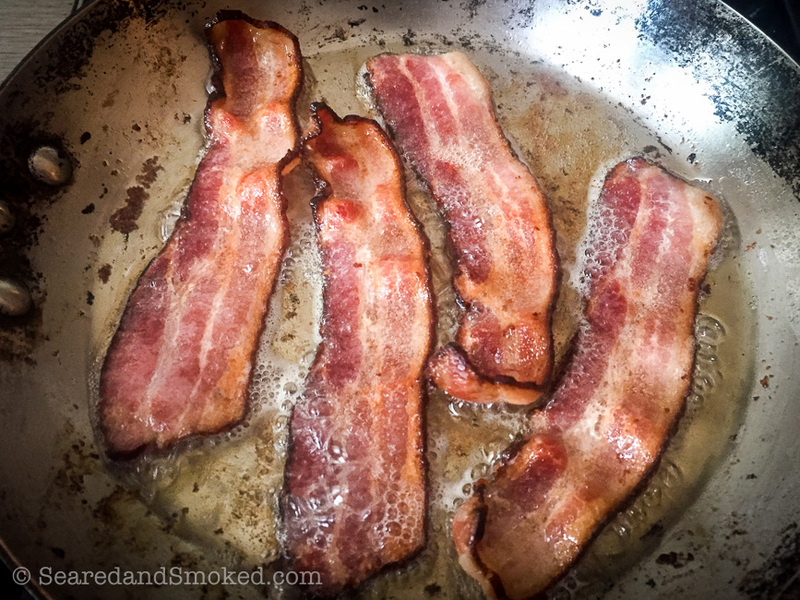 Remove the bacon right when both sides start to become a nice light golden color – This is a learning process, but generally take it off when both sides of the bacon become light golden in color. 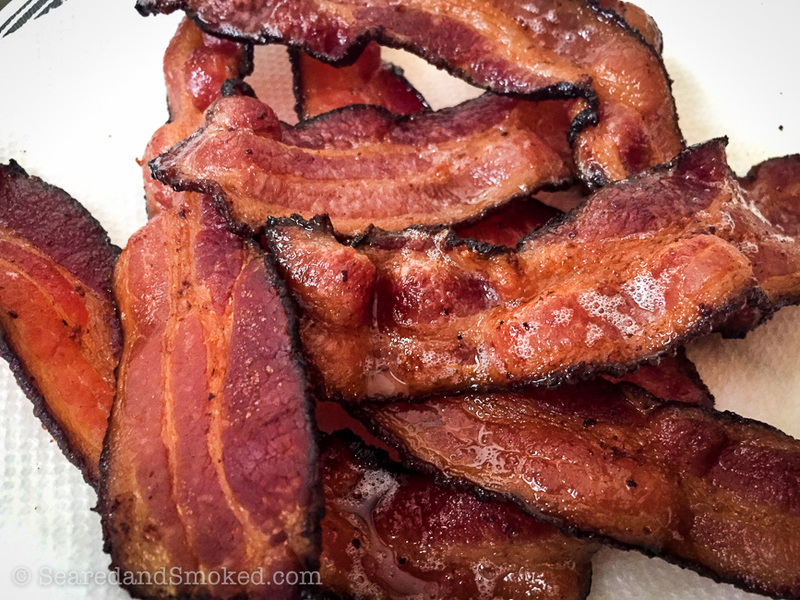 If you are switching to high quality bacon for the first time, you will notice that you do not have to kill it to become crisp after resting for 5 minutes. Those are my methods for pan fried bacon. If you find some of these tips useful, be sure to share with your friends. Nobody deserves flabby or burnt bacon. Save a friend! I think every long road trip deserves to have Beef Jerky. In this case, Sriracha Beef Jerky. Sweet, salty, with a hot finish. 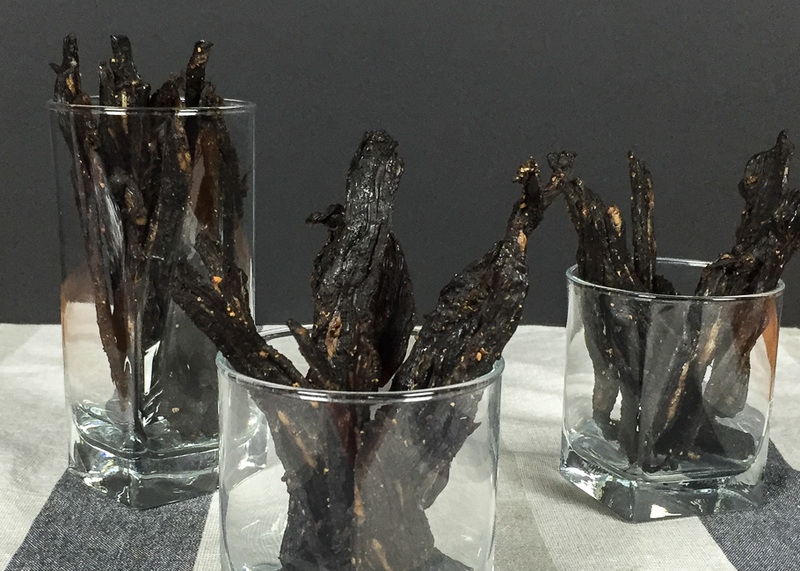 It is my new favorite beef jerky recipe. Every winter my Wife and I drive back to Pennsylvania to visit her family. This Sriracha infused Beef Jerky is going to get us all the way from Iowa to Pennsylvania in one piece. All 1000 miles entirely on Interstate 80. This beef jerky will get you through a few moments of hunger and more importantly some moments of boredom staring at the road. And, if we do not eat our entire stock we recently made, we will have a nice gift for our family when we arrive. 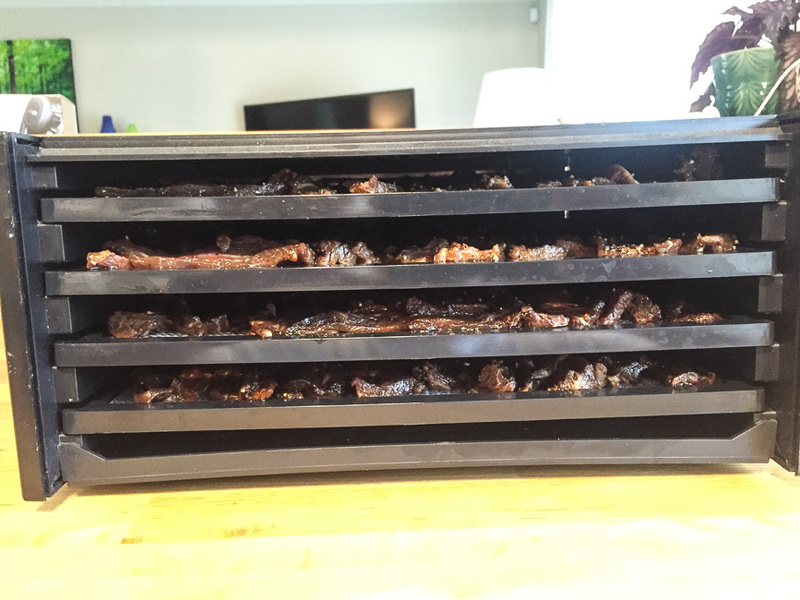 If you have not made beef jerky before, the only oddball piece of equipment you will need is a dehydrator. I have a small one I purchased at Cabela’s several years ago that will hold about 4 lbs of meat. To my surprise, you can still buy this 4-drawer model at Cabela’s. However, you can find it much cheaper here at Amazon. It works great. I would highly reccommend the 4-drawer model or go for the 9-drawer model if you want more capacity. It dehydrates very evenly and the temperature control works great. If I were to do it again, I would get the 9-drawer model to cut down on how many batches I have to make. 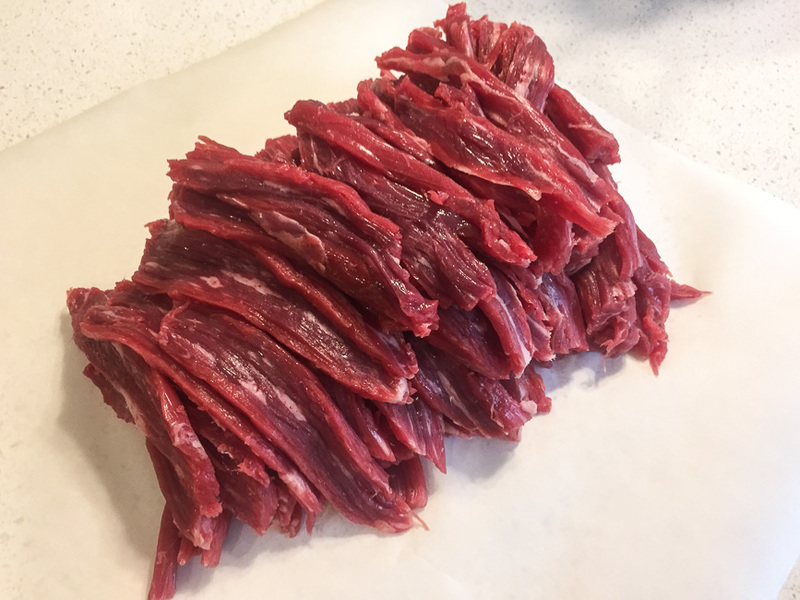 I do not make jerky too often, but I make a lot when I do. 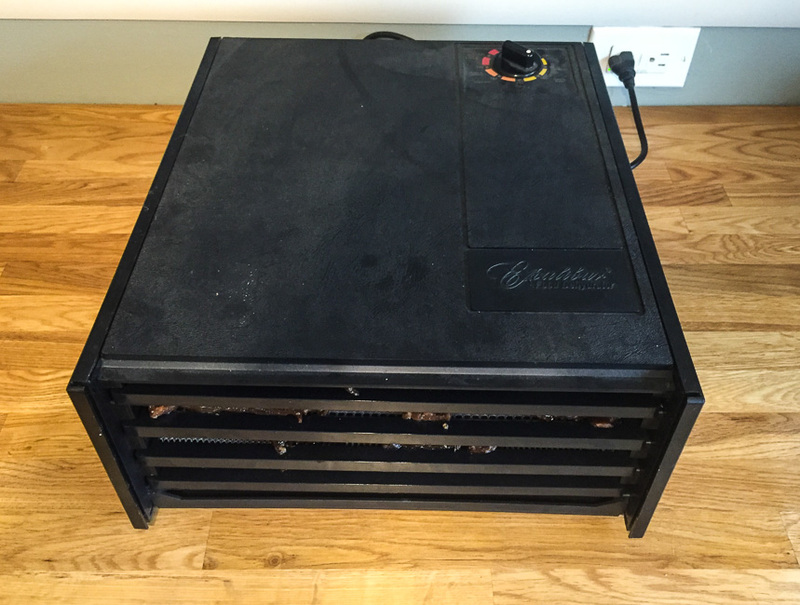 If you have been on the fence on buying a dehydrator, I would go for it…. 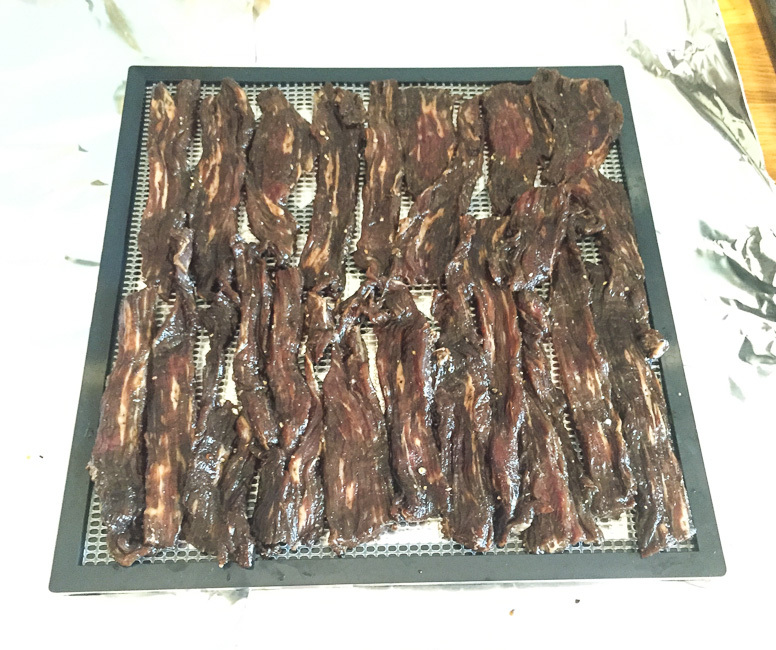 making jerky at home makes me feel like a kid. Simple pleasures. 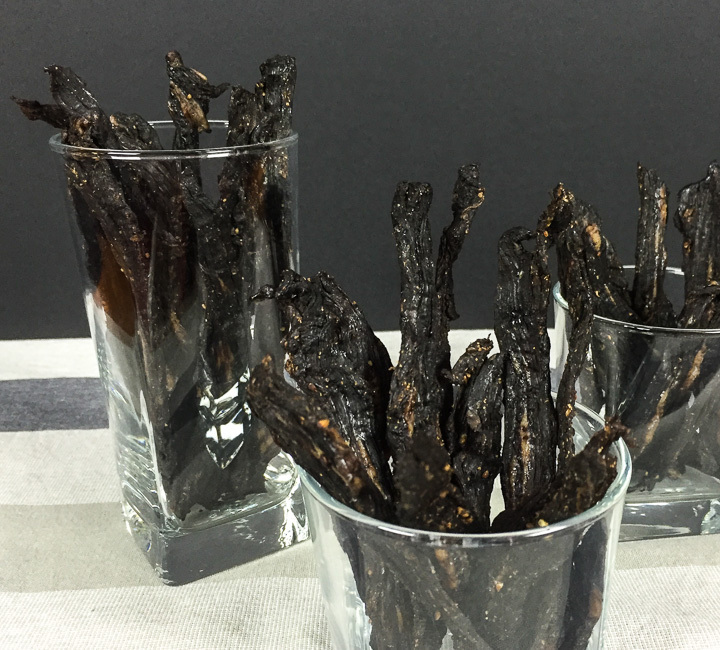 Your patience waiting for the jerky to dry will be paid off when you unload your new stash off the dehydrator. Mother load! 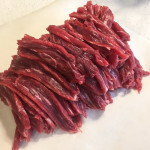 The only real critical steps to making jerky are meat selection and slicing the meat. I have had the best luck with Flank Steak. It has a real nice quality about it for the finished product. 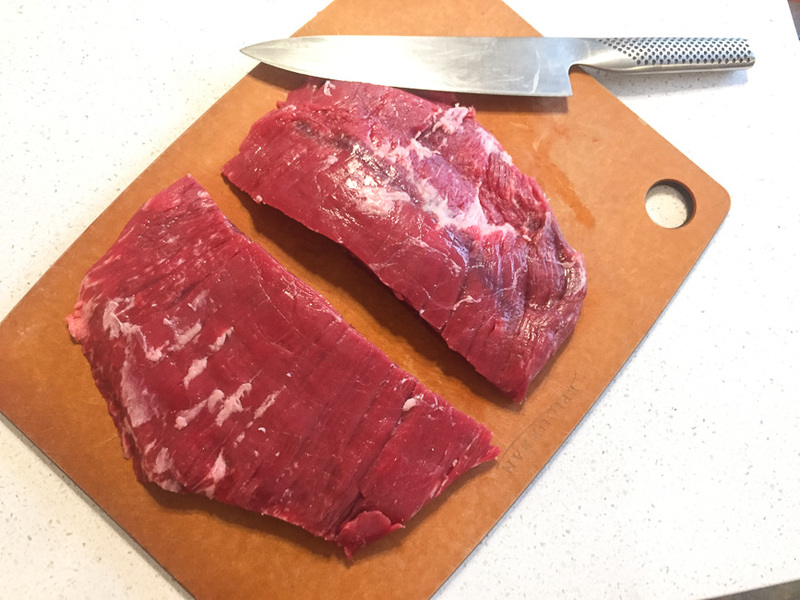 Slice the flank steak thinly with the grain of the steak. It allows you to easily handle the meat before dehydrating without it falling apart. Then, when it is finished, you are able pull apart the jerky pretty easily and it does not take a lot of work to chew. I have not had the same luck with sirloin and other cuts of meat that are not crazy expensive. Dehydrating the steak can take anywhere from 12 hours to 36 hours depending on humidity and drying temperature. If I have time I like to set it at lower temperatures. I feel it makes the jerky more tender. If you give this recipe a try, share your results! I would love to hear how it goes. 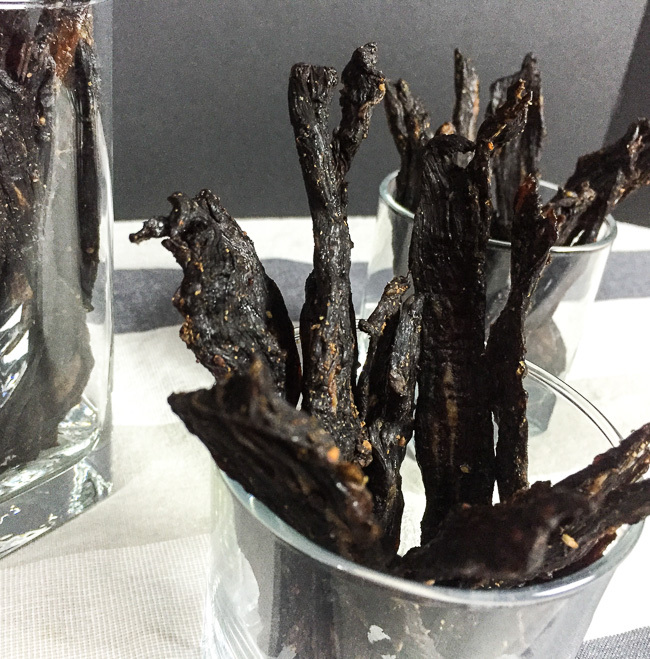 Quality beef jerky made right at home. Sweet, Salty, with a spicy finish. Trim off any excess fat from the flank steak. Cut into manageable slabs, approx 5-6 inches long. Place slabs of flank steak into freezer for 20 minutes to chill. This will make it easier to slice. Take each slab out one at a time. Slice with the grain of the steak to create long pieces of meat 1/8" to 1/4" wide. Try to be consistent so the meat dehydrates evenly. You want it thinner than a standard pencil. Place sliced steak into a gallon sized ziplock bag. Mix up marinade solution. Stir together so the honey and sriracha are dissolved into the solution. Pour into the bag. Close the bag, trying to remove all the air out of the bag when closing. Make sure marinade is evenly distributed. Move the bag/meat around if needed. Place in fridge overnight, or up to 2 days. When ready to dehydrate, remove steak and place into a colander and strain the excess liquid. Place strips of steak close to one another on each dehydrator sheet, maximizing the amount of steak on each sheet. Close up dehydrator and turn on dehydrator. You can set the temperature anywhere from room temperature to 185 F. It just depends how fast you want to complete the dehydration. I usually use a temperature of 110 F and check it 24 hours later. 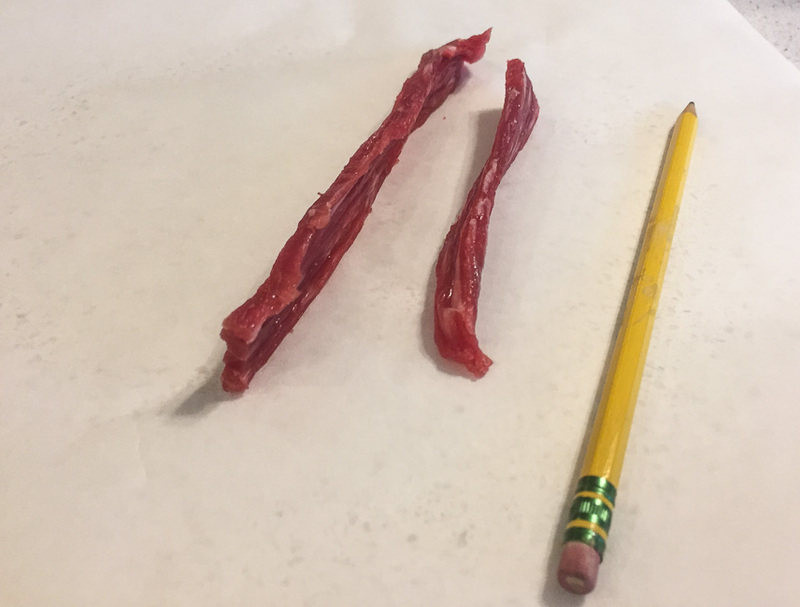 When it is done, the jerky should be rigid and should break when you bend it. Add less Sriracha if you do not want as much heat. I love spending time by the smoker most of the year and often fire it up during winter. 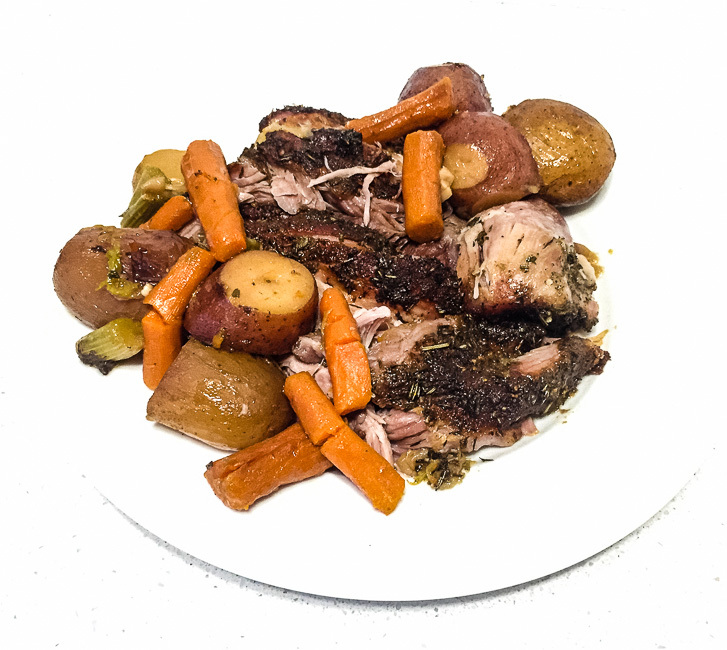 However, this Rosemary Pork Roast, cooked in the oven, is so damn good I find myself waiting for bad weather to come around to push me indoors to make this. If you have a small crowd coming over for dinner this holiday season, I would lean on this recipe for a home run. I get awesome feedback from friends whenever this is on the menu. Before we get started with this delicious feast, we need to pick out a good pork roast. For me, that means a Bone-In pork shoulder. The size is totally dependent on the how many people you want to feed and how fast you want to cook it. I usually shoot for an 8 lb pork shoulder to feed 8-10 people for dinner. The cooking process will take about 7 hours for an 8 lb pork shoulder. To get started, we are going to trim any excess fat off the pork and brine in overnight in a sweet & salty water bath. We are using a combination of kosher salt, brown sugar, white pepper, and seasoned salt to punch some extra flavor and moisture into the pork roast. I use an 8 quart spaghetti pot to hold the brine and pork shoulder overnight in the fridge. When you are ready to assemble the roast and veggies to go in the oven, pull the pork shoulder out and rinse it thoroughly. Then pat it dry with paper towels. 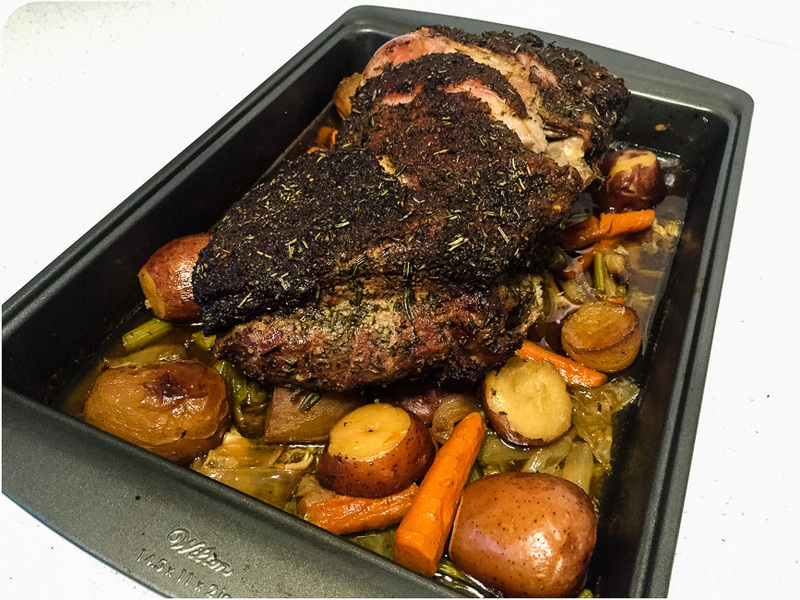 While your pork roast hangs out, chop the veggies and place them in a large roasting pan, creating a comfy nest for your pork shoulder to rest on. Then season the pork with a nice even coating of the rub. You do not want it caked on there, but definitely a good coating. Place the pork on the veggies, add 2-3 cups hot water to the roasting pan, and throw that sucker in the oven at 450 F for 15 minutes. Then temp down to 300 F for 3 hrs. Then temp down to 275 F for the rest of the cook, covering the pan for the last 90 minutes with foil. 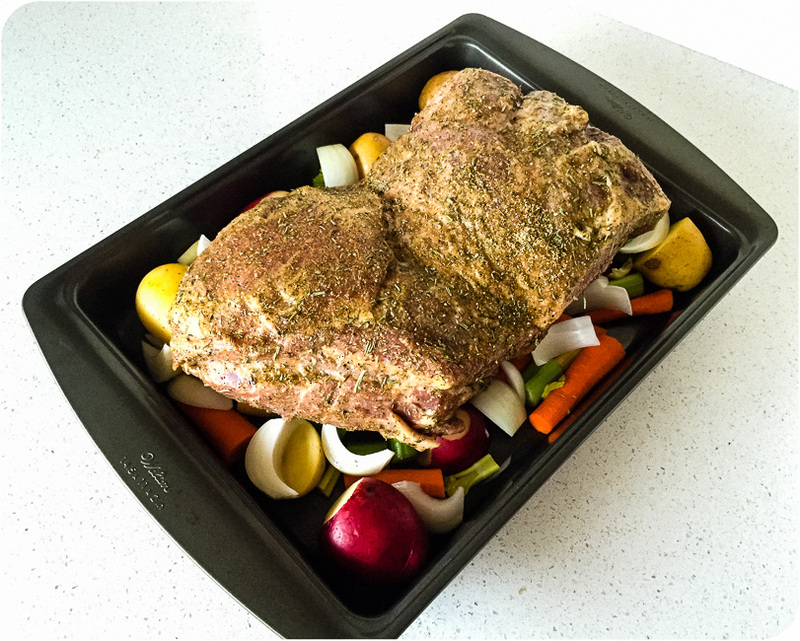 Measure the internal temperature before pulling from the oven and it should be around 195-200 F. If your pork shoulder is over 8 lbs, I would add 30-45 min per pound. After you pull the pork roast out, let it rest covered in the pan for 30 minutes-45 minutes. Pull apart in large chunks and divide to serve if needed. Drain and reserve the juices in the pan to serve as an Au Jus to spoon over the pork. The crust is full of awesome salty sweetness and the pork is so tender and juicy and you can eat it all day by itself. 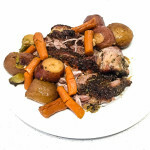 For this post, I made the Rosemary Pork Roast with potatoes to serve alongside the pork. If you want to dress up the dinner a little, omit the potatoes from the roast and make mashed potatoes to serve with the pork. You’ll love it. Not even joking. So good! 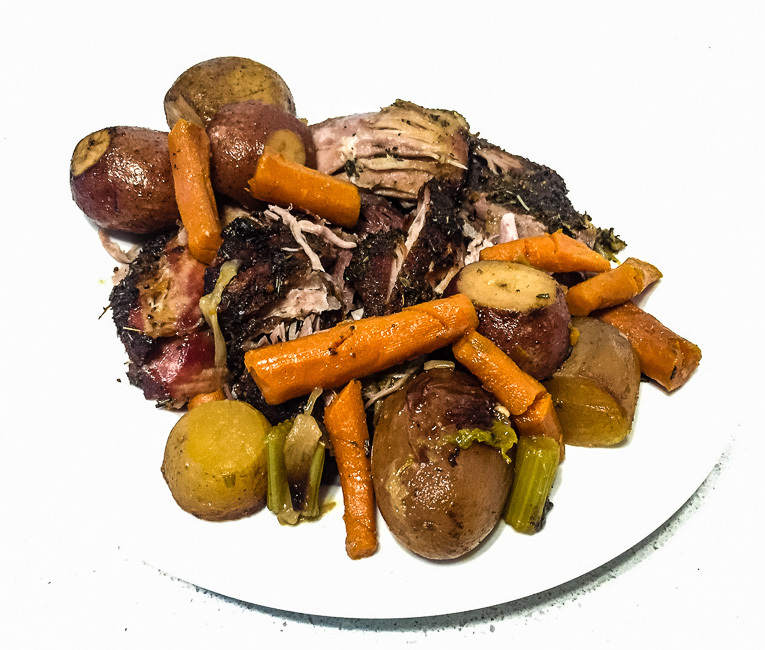 This sweet and salty rosemary pork roast is not your mother's pork roast. It is fall off the bone tender with a sweet and salty crust on the outside, giving it a real depth of flavor. The day before cooking the pork... Add hot water to a large pot - I use an 8 quart pasta pot. Mix in the dry brine ingredients and stir together. Rinse the pork shoulder and trim any excess fat off all areas. Add pork shoulder to the pot and cover. Refrigerate overnight. The morning of the dinner, pull the pork shoulder from the brine. Rinse thoroughly and pat dry with a paper towels. Mix up the rub and apply an even coating of the rub all around the pork shoulder. You will have excess rub. 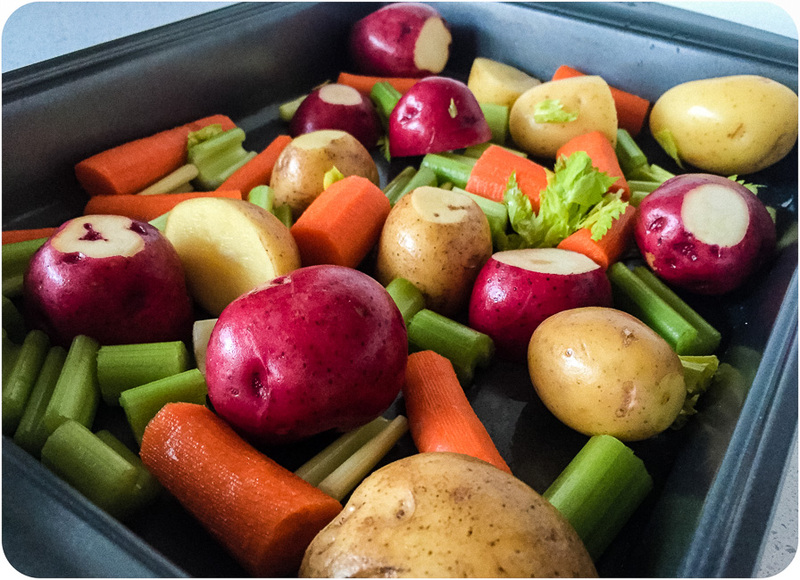 Roughly chop the vegetables and add to a roasting pan. Add 2-3 cups of hot water to the pan. Enough to have 0.5 to 1 inch of water, but not so much the vegetables are floating around. Place in the oven at 450 F for 15 minutes - this helps develop the crust. Reduce heat to 275 F for the rest of the cook. Let go uncovered for 3 more hours. At 6 hours into the cook, cover the pan with a large piece of foil. Cook for another 90 minutes. Pull and let rest covered for 30-45 minutes. Drain pan juices and reserve for a nice Au Jus at the table, to spoon over the pork & vegetables. Add or reduce time depending on the size of the Pork Shoulder. I would plan on 30-45 min for each pound. When fall off the bone tender, the internal temperature should reach around 200 F. Check with a fork for tenderness.